November's tween book club selection was Among the Hidden by Margaret Peterson Haddix. I was VERY curious to see what the kids would make of this book. I personally really enjoyed it and now that we've discussed the first book I can finally finish reading the series! If you're not familiar with the series, it's my new (to me) go-to pick for realistic middle grade science fiction. It's good read-alike for fans of Lois Lowry's The Giver. I used Multnomah County's book discussion questions and adapted them to fit our discussion. The kids had some great things to say and made some particularly keen observations about the setting of the novel (which they thought was Pennsylvania 50-100 years from now) but without huge technological innovations. One girl called it "the opposite of The Jetsons." My book club doesn't meet in December so our next selection will be Storm Runners by Roland Smith in January. I showed the kids this video with Roland Smith (which does have some mild spoilers) to get them excited for our next meeting. 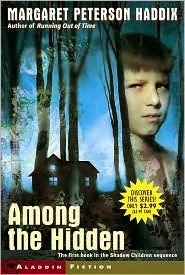 This was one of the rare series that both my daughter and my son loved in about 5th or 6th grade. In general they had opposite tastes. Sometimes it's hard to find series that appeal equally to both genders, but I think this is one. And it's very much in the dystopian tradition that's so popular right now. Would you mind sharing a couple of Tween Book Club ideas? First, what books have been total hits and which have not? You appear to have a club each month. Is that weekly or one time per month? We began a Tween Club this fall, and I scheduled Wonder by RJ Palacio over six consecutive weeks. Some read ahead and weren't remembering much of the book by the sixth week. How do you schedule your club?